— A memento flown by the astronauts on the first moon landing has been recreated for the first time in commemoration of the 50th anniversary of the historic NASA mission. 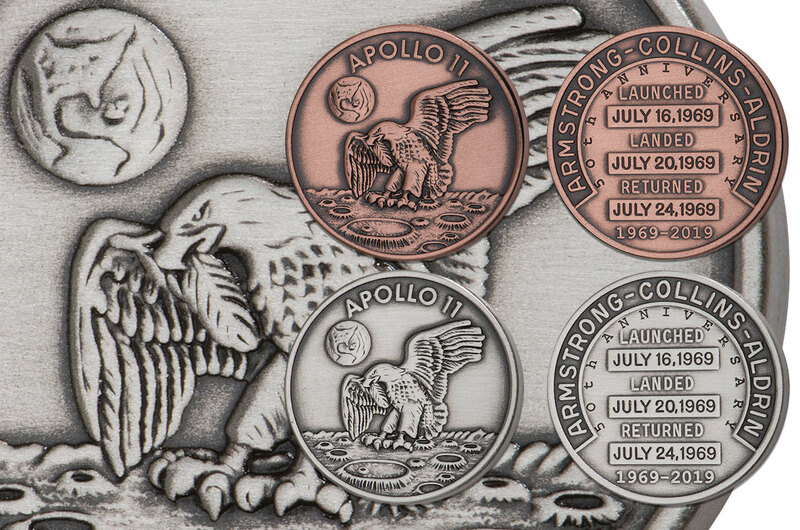 Asset Marketing Services, working with the astronauts' families and Sunshine Mint, has restruck the Apollo 11 Robbins medallions using dies created from the 1969 originals. The new 50th anniversary-edition medallions are making their public sale debut on Tuesday (Aug. 14) at the American Numismatic Association World's Fair of Money in Philadelphia. They will become more widely available beginning in September. The Robbins medallions, called such for the company that minted them for the crew, were the one unique space-flown souvenir that was created for and only available to the astronauts. First minted for the Apollo 7 mission in October 1968, the medallions were struck for each of the subsequent Apollo missions and have continued to be produced for every U.S. human spaceflight since. 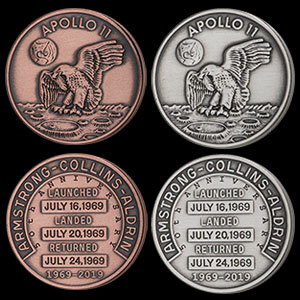 The medallions, which were produced in silver and gold, feature a rendering of their respective mission patch on the front and are stamped with the flight dates on the back — for example, in the case of Apollo 11, the launch date, the date of the landing on the moon and the date the crew returned to Earth. The silver medals were available for purchase by the crew and other astronauts in NASA's corps at the time. The gold medallions were limited to the mission's crew only. Packed among the crew's personal preference kits, the medallions often become gifts for family and friends after the mission was over. As a point of interest, the Apollo 11 medallions featured the crew's intended design for their mission patch, showing an eagle approaching the surface of the moon with an olive branch in its beak. The insignia was altered before the mission to move the branch to the eagle's talons to avoid it looking too hostile, but remained as originally envisioned on the medallion. 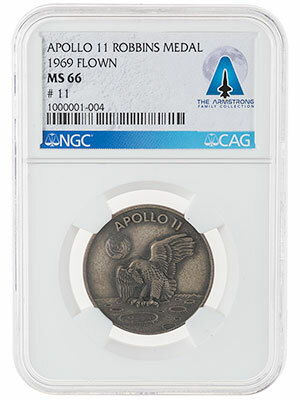 In the decades since, the Apollo 11 Robbins medallions became prized and highly-sought after collectibles on the secondary, or collectibles, market. Examples of the silver medallions have sold in recent years between $35,000 and $50,000 each. The dies used to mint the Apollo 11 Robbins medallions were at some point given to Neil Armstrong, the commander of the mission and the first human to step foot on the moon. 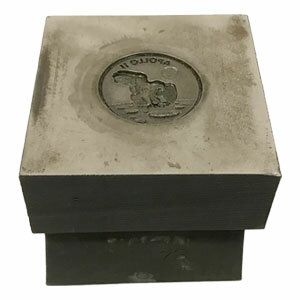 Mark Armstrong, the late astronaut's son, recently provided the half-century-old dies to Asset Marketing Services for new dies to be engraved. The new dies were modified to include additional inscriptions, "50th Anniversary" and "1969-2019," on the reverse of each new medallion. The modification ensures the new issues cannot be confused for the flown medallions. Asset Marketing Services, through its brands ModernCoinMart and GovMint.com, will offer the 50th anniversary Apollo 11 Robbins medallions in several editions. On Tuesday, sales began on copper and silver-plated copper editions at the World's Fair of Money. The open edition copper medallions retail for $19.95 each. The silver-plated edition, which mimic the look of the original Robbins medallions and are packaged with an embroidered Apollo 11 patch, are limited to 50,000 pieces and priced at $39.95. Asset Marketing Services plans to introduce additional versions, including silver and gold medallions with a finish featuring Apollo-flown metal. All four editions will be available for purchase through the ModernCoinMart website in September. A portion of the proceeds from the sale of the 50th anniversary Apollo 11 Robbins medallions will given to charities supported by the Armstrong, Buzz Aldrin and Michael Collins' families. "It was our goal to design the special symbolic commemorative that celebrates and gives back to the space community," said Bill Gale, Asset Marketing Services chief executive officer, in a statement. "The charitable donations from these commemorative medals are endorsed by the Apollo 11 astronauts' families." In addition to the anniversary-edition medallions, the World's Fair of Money is also hosting an exhibit of items from the Armstrong Family Collection, as presented by the Collectibles Authentication Guaranty (CAG). 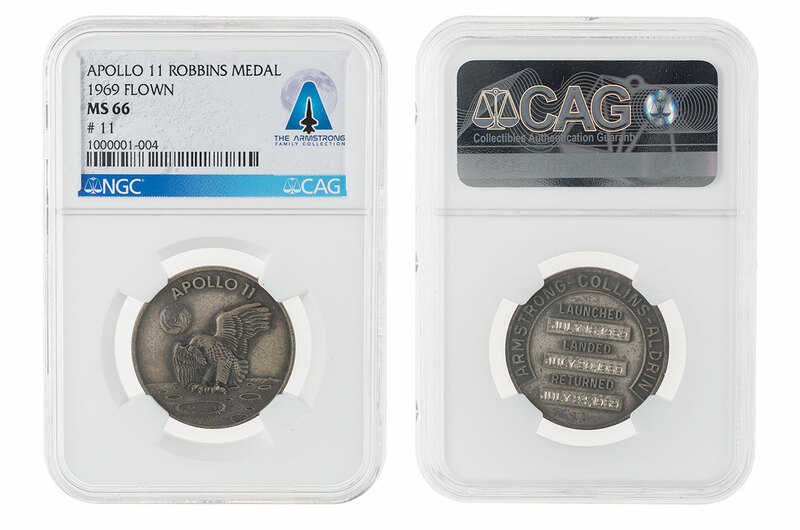 The artifacts, which will be sold by Heritage Auctions beginning in November, include Armstrong's Apollo 11 flown gold Robbins medallion.